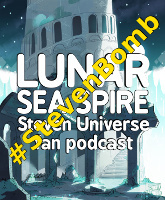 Ken, GC13, and Dakota kick off our daily #StevenBomb coverage with a discussion of Rose’s Scabbard. How do immortal beings cope with the loss of a loved one? What was the deal with the pyramid temple in Serious Steven? Pearl: threat or menace? Be sure to check back daily as we cover the previous day’s episode! Pearl and Rose could have had a romantic relationship, or it could have been more akin to a knight and their king. Either way, I think we can all agree that Pearl loved Rose as much as anyone could. To me, the exact form of that love isn’t too important to the overall way the scenes play out.